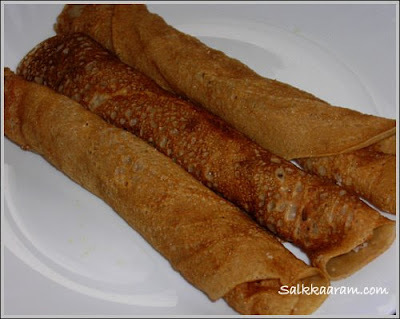 Madakku Pola / Folded Crepes | Simple and Delicious ! 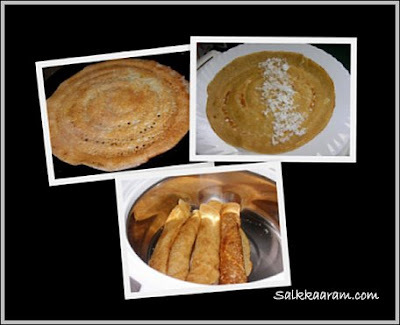 Last year, I had written about the white beautiful polas / arippodi dosa / rice flour pancakes from our cuisine.It still remains as a wonderful member of the breakfast / dinner menu which can be taken with any curry! This time, another "pola" from my place which you might have noticed in many other blogs in various attarctive names! Love letters,madakku san, mutta kuzhalappaam, Thera ada,elaanji.. etc are the names I could see in other blogs.Earlier maida / all purpose flour is used for making this, but at home we altered it to aatta / wheat powder or a mixture of aatta and maida.During childhood, we often enjoyed this snack, which was enough to fill the stomach! Nowadays this lovely pola has been one of the kid's favourites, and I enjoy making this for them.. You can change the filling according to your taste, jaaggery or sugar with coconut, plantains etc..I used Aatta for making this, hence it got the golden color. Break the egg into the flour. Blend them with enough salt and water. Make a medium thick batter by adding enough water.You can avoid adding egg if you don't like.The batter should be without lumps. (If you like cardamom flavour , add a cardamom while blending). Heat a frying pan / griddle, pour one or two ladle ful of batter.Spread it using the back side of ladle.Do it carefully. When one side is coooked, flip it over, and pour little ghee (1/2 teaspoon or more) over it.When the other side too cooked, remove from the griddle, and keep on plate. Put grated coconut-sugar or coconut-jaggery mixture over it and fold. Hmm is a coconut crepe :) Delicous flavor! i have tasted this long back at a family friend's place. memories! yummy breakfast item Seena :)) simple to make too. I do similar in our aappam batter!This sounds good too,sure wheat and coconut,sugar mixture makes a great combo and tastes great too! sorry dear ..eppol avi kku vacation allee.so ariyaloo ..always busy ..athinu munnu evide ellarkkum thort infection um cough okke aayirunnu ..so blogging okke kuravayirunnu ..vere arude bog il keran thanne time illa ..!!! Oh yes this is something we had a lot when we came back from school and I have to tell you i used to hogg them, atleast 4. This looks so yumm yumm. Wow....it looks so yummy! Wonderful! delicious crepes. should try once. this is such a great snack! I make this except no egg! we call it just the gothambu dosa back home..and I normally like it with chammanthi...used to be a regular evening dish..and we used it have perched on a pedestal in the kitchen itself..pipping hot!! crepes looks lovely & perfectly made..
wel in manglore its called LOVELETTER...this was one of our routine snacks in hostel...nostalgic!!! Seena this is not madakku pola. Madakku pola nammude chaayakkadayil kittunna pala paalikalaayittulla sugar velayippichathil mukkiya oru palahaaramalle? dossayil stuff cheythathu Pan Cake Aanu.